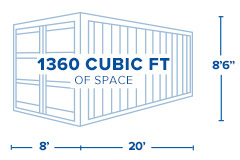 Interport’s DuoCon shipping containers offer the storage capacity of a 20-foot container, the ease of access of a double-door unit, and the flexibility of two separate spaces. Our 2×10 DuoCon containers are two 10-foot shipping containers welded back-to-back to fit the form of a standard 20-foot shipping container. DuoCon shipping containers are easy to load and handle and can be more cost effective to ship than two 10-foot containers. Interport offers the Northeast’s largest selection of new DuoCon shipping containers, available for immediate sale and next-business-day delivery. Length: 20ft. Length: 19ft. 1in. Width: 7ft. 6in. Gross: 67,200 lbs. Width: 8in. Width: 7ft. 7in. Height: 7ft. 4in. Payload: 61,200 lbs. Height: 8ft. 6in. Height: 7ft. 8in. Tare Weight: 6,000 lbs. Length: 20ft. Width: 8in. Height: 8ft. 6in. Gross: 67,200 lbs. Payload: 61,200 lbs. Tare Weight: 6,000 lbs.